Piercing the sky at a phenomenal 270 metres, it makes its debut as one of tallest residential towers in Australia. This is architecture on a truly grand and global scale. A symbol of Brisbane’s rise as a contemporary, international new world city. The views are exhilarating. Its towering heights are awe-inspiring. A fusion of bustling city life, view-filled living spaces and five-star resort facilities in one iconic building, every day brings moments of wonder. 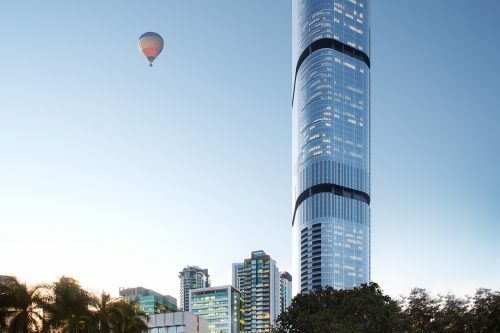 Outside, the tower will transform Brisbane’s skyline. Inside, it bestows an extraordinary level of residential amenity. From Australia’s highest infinity pool at the tower’s crown to its incredible recreation decks and luxury Health Club and Spa, life within Brisbane Skytower offers more than simply apartments in the sky. It gives its residents truly unforgettable and personalised living experiences.